Desmond Nunez, Guy Kenyon,	The Journal of Laryngology & Otology, Volume 124 Issue 11, p 1145. Y Ramakrishnan, S Alam, A Kotecha, D Gillett, A D'Souza,	The Journal of Laryngology & Otology, Volume 124 Issue 11, pp 1146-1152. A C Nunes Ruas, V Cavalcanti Rolla, M H de Araújo-Melo, J Soares Moreira, C M Valete-Rosalino,	The Journal of Laryngology & Otology, Volume 124 Issue 11, pp 1153-1157. S I Ibrahim, P P Cheang, D A Nunez,	The Journal of Laryngology & Otology, Volume 124 Issue 11, pp 1158-1161. T Sasaki, A Xu, K Ito, S-I Ishimoto, T Yamasoba, K Kaga, N Yamauchi,	The Journal of Laryngology & Otology, Volume 124 Issue 11, pp 1162-1166. Patients with benign paroxysmal positional vertigo and cervical spine problems: is Epley's manoeuvre contraindicated, and is a proposed new manoeuvre effective and safer? 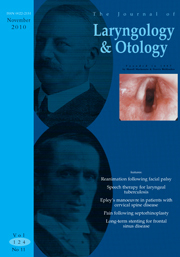 U M Rashad,	The Journal of Laryngology & Otology, Volume 124 Issue 11, pp 1167-1171. J C L Yeo, O J Hilmi, G W McGarry,	The Journal of Laryngology & Otology, Volume 124 Issue 11, pp 1172-1177. M Bignami, I Dallan, P Battaglia, R Lenzi, A Pistochini, P Castelnuovo,	The Journal of Laryngology & Otology, Volume 124 Issue 11, pp 1178-1182. Z Shen, D Ye, X Zhang, Z Jiang, B Xiao, J Guo,	The Journal of Laryngology & Otology, Volume 124 Issue 11, pp 1183-1189. H Bajwa, S Kumar,	The Journal of Laryngology & Otology, Volume 124 Issue 11, pp 1190-1193. P Szychta, B Antoszewski,	The Journal of Laryngology & Otology, Volume 124 Issue 11, pp 1194-1199. Z Vourexakis, M-I Kos, J-P Guyot,	The Journal of Laryngology & Otology, Volume 124 Issue 11, pp 1205-1208. P Rainsbury, A Mitchell-Innes, H Wilson, M Prior,	The Journal of Laryngology & Otology, Volume 124 Issue 11, pp 1209-1211. C M Philpott, A R Javer,	The Journal of Laryngology & Otology, Volume 124 Issue 11, pp 1212-1215. B Hunter, S Silva, R Youngs, A Saeed, V Varadarajan,	The Journal of Laryngology & Otology, Volume 124 Issue 11, pp 1216-1222. T Goto, N Bandoh, T Nagato, M Takahara, Y Harabuchi, Y Tokusashi, N Miyokawa,	The Journal of Laryngology & Otology, Volume 124 Issue 11, pp 1223-1226. R Ricks, R Banga, M Porter,	The Journal of Laryngology & Otology, Volume 124 Issue 11, pp 1227-1228. D Bray, L Cavalli, N Eze, N Mills, B E J Hartley,	The Journal of Laryngology & Otology, Volume 124 Issue 11, pp 1229-1233. S Hayashi, H Hirose, N Tayama, H Imagawa, M Nakayama, Y Seino, M Okamoto, M Kimura, T Nito,	The Journal of Laryngology & Otology, Volume 124 Issue 11, pp 1234-1238. R Consalici, D Dall'Olio,	The Journal of Laryngology & Otology, Volume 124 Issue 11, pp 1239-1241. D Biswas, L Karsai, S L Atkin, R J England,	The Journal of Laryngology & Otology, Volume 124 Issue 11, pp 1242-1244. O Mulla, F Agada, D R Strachan,	The Journal of Laryngology & Otology, Volume 124 Issue 11, pp 1200-1201. J Doshi, R Irving,	The Journal of Laryngology & Otology, Volume 124 Issue 11, pp 1202-1204.